Breakfast in America can be serious stuff. Bacon, eggs, harsh browns, pancakes, and maple syrup. Truckers tucker that may energize you until late lunch or early dinner time. In June I started a new and better life that seriously altered my breakfast habits. 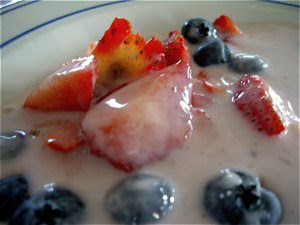 Bread, cheese, and coffee were switched to yogurt, fresh fruit, and fruit juice. This regime has meant 7 kilos (15 lb’s) less to carry, and a good appetite to lunch - fresh salad. Breakfast in America in September bore the mark of my new life. I roamed through the supermarkets hunting for my favourite fruit, but first I tried some interesting new yogurts, as this large container of vanilla yogurt enjoyed during my days in Scituate. 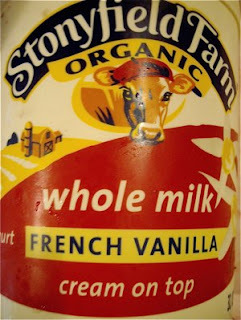 My cousin Erica knew that the organic vanilla yogurt from Stonyfield Farm meant quality and it really did. Creamy, tasted like custard, and low in calories, meant breakfast time equalled pudding time. Tartness of berries contrasted by soft, sweet, vanilla velvet. If there is something called dessert innovation, I had my innovation encounter when staying with my cousin Anne in Salisbury Beach, further up the coast, but still within the Commonwealth of Massachusetts. Innovation brought to you by Dannon (or Danone in Europe). 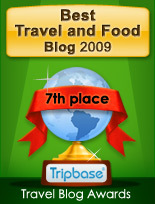 Dannon is a well known brand in Europe. I know it from my own supermarkets as the creator of the probiotic lines Actimel and Activia, dairy enforced with good bacteria, to improve digestion and immune systems. 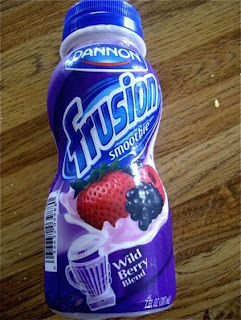 Dannon in the US has product the dairy product concept one step further with an exciting new line of smoothies. 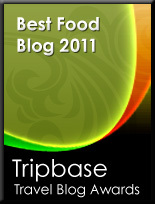 Frusion - Smoothies, delicious blends of fresh fruit, fruit juice and yogurt, are getting increasingly popular. Delicious fresh fruit and the good thing that it is healthy for you, unless you add a lot of sugar to them, that is. My cousin was rather addicted to these small bottles, and she bought a wide range of tastes. I LOVED the pinacolada taste. Even without alcohol it tasted like the real thing. This one, with wild fruit and strawberries was poured over my fruit. Back to the fruit. Large, succulent strawberries and blueberries the size of large bullets, packed with antioxidants ready to protect you against all evil. I indulged in the stuff, as these berries are my favourites, and I do feel that people should eat what they like. 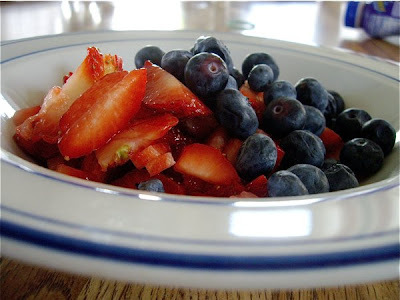 Strawberries sliced in two, blueberries and Dannon smoothies. What an easy way to loose weight! !